Sunset Over Cairo is a studio album. 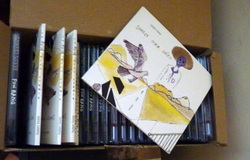 Available as a digipack (cardboard packaging) in 2012. This album is recorded at the legendary Cowshed Studios in London onto Tape. I played the whole album live in the studios to capture the live quality in the music. B-side of Lisse is a collection of songs and sound pieces that didn't end up on the albums but were still interesting enough to release.